3 February 2010, at 9:37a.m. US - 'No egg left behind' is the secret at Ford Poultry, Cobb's top flock for total eggs per hen housed in 2009. Cobb congratulates to Ford Poultry, which is owned by Kevin and Belinda Goss, for having the top flock for total eggs per hen housed for 2009. 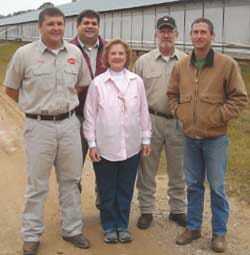 The Goss's farm, located near Pineville in Mississippi is under contract to Tyson Foods. The farm rose to the top of a total of over 2000 Cobb500 flocks with 184.84 total eggs per hen housed. Breeder manager, Scott McKinion, and assistant breeder manager, Dale Cockrell, both agree that Mr Goss's desire and drive to be the best and to work with the production team at Tyson is the main reason for success. Mr Goss employs some people to gather eggs, however farm management, repairs and feeding are considered to be his direct responsibilities as the farm owner. In 2006, the Goss Family purchased the nine-year-old farm in poor condition. Through hard work and a willingness to learn, they turned the farm around to an excellent production facility. The family, including the four children and his mother, Nola Tedford, all work on the farm. She summed up the success and the farm motto with the comment, "No egg left behind". The family also operates a very popular 'U-Pick' farm of tomatoes and purple hull peas demonstrating their drive to succeed. Cobb congratulates the Goss family on a job well done and also the Tyson Foods production team at the Mississippi complex for their support.